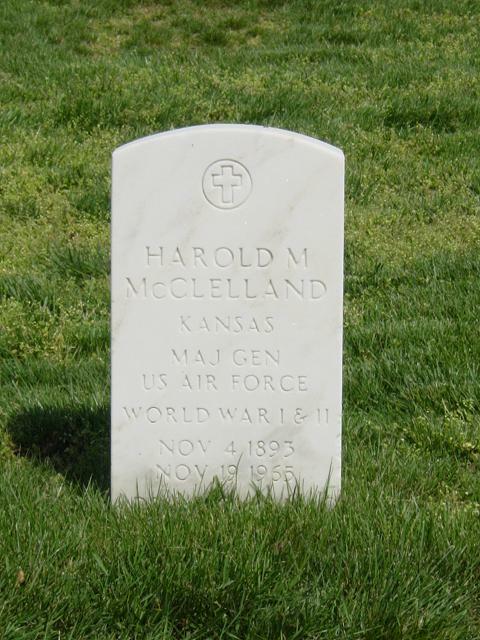 Harold Mark McClelland was born in Tiffin, Iowa, in 1893. He graduated from Kansas State Agricultural College with a bachelor of science degree in 1916. He was commissioned as a regular Second Lieutenant August 18, 1917 and was promoted to First Lieutenant at the same time. General McClelland was assigned successively to the Army service schools at Fort Leavenworth, Kansas, and on November 19, 1918, he joined the 48th Infantry at Norfolk, Virginia. Detailed to the Aviation Section of the Signal Corps, he earned his wings by attending ground school at the University of Texas, flying gunnery and advanced fighter courses at Rockwell Field and San Diego, California. Then followed assignments at Garden City and Roosevelt fields, New York, and in December 1918, he became commandant of training, commanding officer of the cadet detachment and assistant engineering officer at Love Field, Dallas, Texas. In July 1919, he was stationed at London, England as assistant aviation officer, Headquarters of the Provisional District of Great Britain. He also saw service in England with the U.S. Army Liquidation Mission. Returning to the United States in January 1921, he attended the Air Service Communications School at Fort Sill, Oklahoma, and after graduation, remained there as an instructor. In February 1922, he was assigned to the Signal Corps radio laboratory at Camp Alfred Vail, New Jersey, as Air Service representative and from August 1922 to February 1924, was officer in charge of the laboratory. Transferred to Mitchel Field, New York, in September 1924, with the 9th Observation Group, he was postal signal officer and instructor in communications at summer training camps. From September 1925 to May 1926, he attended a special radio course at Columbia University. He left Mitchell Field October 1, 1927 to serve the next four years in the Training and Operations Division, Office of the Chief of Air Corps, at Washington, D.C. He then was given command of the 19th Bombardment Group, which he organized in 1931 and commanded until 1934. He drew two unusual assignments in 1934. When the Air Corps took over flying the air mail, General McClelland acted as zone communications officer at Salt Lake City. Later in the year, he was communications and meteorological officer for General H.H. Arnold's Alaskan f1ight, which was to do much in shaping the trend of air communications. In October 1934, he was given command of Rockwell Field and Rockwell Air Depot. In 1935 he began a series of courses, which saw him graduate from the Air School Tactical School, the Chemical Warfare School and the Command and General Staff School. In 1937 he became inspector for the General Headquarters Staff School. In 1937 he became inspector for the General Headquarters Air Force at Langley Field, Virginia. In August 1938, he was assigned to the Operations and Training Division of the War Department General Staff, Washington, D.C., and became chief of Aviation Branch of that division February 21, 1941. In May 1941, he was assigned as assistant chief of staff for operations and training of the Special Army Observer Group in London, England, and upon entry of the United States in World War II he was assistant chief of staff, training and operations, European Theatre. He returned to the United States in July 1942 and was assigned to Headquarters Army Air Forces, Washington, D.C., where he was director of technical services until March 1943. After serving the next several months as deputy assistant chief of Air Staff, operations, Headquarters Army Air Forces, he became the air communications officer in July 1943. On April 8, 1946, he became the commanding general of the Airways & Air Communications Service. Upon creation of the Military Air Transport Service, June 6, 1948, General McClelland was named deputy commander, services. These services included Airways & Air Communications Service, Air Weather Service, Air Rescue Service, Flight Service and National Interest Bases. In addition to his new duties, he continued as commanding general of Airways & Air Communications Service until September 10, 1948. On August 30, 1949, he was appointed director of communications-electronics in the Department of Defense, with station at Washington, D.C. He has been awarded the Distinguished Service Medal, the Legion of Merit, and is a Commander, Order of the British Empire. His DSM citation reads, "... as air communications officer, Headquarters Army Air Forces from July 1942 to August 1945, (General McClelland) supervised the Army Airways Communications System which furnished communications and navigational aids along the military air routes throughout the world. He pioneered in military electronics, analyzed the enemy's scientific research in this field and instituted radio and radar countermeasures." General McClelland is rated as a command pilot.